Hello and welcome to the UTHealth School of Public Health in Dallas. The Dallas campus was founded in 1998, to offer a master of public health (MPH) to the population of North Texas. The campus is hosted by the UT Southwestern Medical Center at Dallas. From our initial offering of an MPH degree, we have expanded our degree programs to include a PhD in Epidemiology and in Behavioral Sciences. 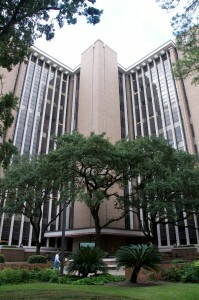 The Dallas Campus also has one of the largest MD/MPH dual degree program in Texas. Members of our faculty are nationally and internationally renowned experts in several fields of public health such as cancer prevention and control, cancer survivorship, health services and outcomes research, implementation science, tobacco cessation, substance use research, and violence prevention. Many students of our program work with faculty on their research studies to get hands-on public health experience. In coming to our campus as a student, you will have access to not only Dallas campus faculty, but also to the other 130 faculty across all campuses of the school. You will also have access to UT Southwestern faculty, and will have opportunity to take advantage of the educational opportunities offered here at the UT Southwestern campus. The Dallas Campus has connections with several public health agencies in the Dallas-Fort Worth area and throughout the state, which you can access to complete practical internships in public health. I am very glad that you are considering our school for your studies. We offer an outstanding and flexible degree plan at an incredibly low tuition rate. Our program will challenge you to think creatively, to excel and to be at your best in contributing to improve the health of the people in our country and internationally. Please get in touch with us if you need any additional information. We look forward to achieving your public health educational goals.